FRANCE’S Ligue 2 had a spectacular climax in 2016-17 with any one of half a dozen teams able to lift the title on the final day of the season. Top spot ended up with Racing Strasbourg, with Amiens finishing in second place, both teams enjoying a second successive promotion. P W D L F A Pts g.d.
For Strasbourg, it represents a major comeback, their fourth promotion since being sent down to French amateur football in 2011. They have a long history in the game, but they’ve been French champions just once, in 1979, when a team that included goalkeeper Dominique Dropsy, full back Raymond Domenech and striker Albert Gemmrich – and a cameo appearance from Arsene Wenger, finished two points ahead of Nantes. Coach Gilbert Gress, who cut a flamboyant figure, was a disciple of the Dutch Total Football school. But his teams were run on a “no-stars” philosophy and built on the foundation of a strong defence. Strasbourg have never gone close to repeating that success and in 2011, they went into liquidation. It was a long way back, but Strasbourg slalomed their way through the Championnat de France amateur 2 (CFA) in 2011-12 and then Championnat de France Amateur a year later. Understandably, attendances had slumped to around 6,500 – barely a third of the 19,000 they were attracting when they were a Ligue 1 club. There was still a considerable distance to go for Strasbourg. They were now in the Championnat National and it was initially something of a struggle. Crowds were up by more than 60% to an average at their Stade de La Meinau of 10,000 but they finished in 16th place, avoiding relegation by six points. But in 2014-15, they missed out on promotion to Ligue 2 by just a point. A year later, they were top and along with Orleans and Amiens, they were promoted to Ligue 2. Current coach Thierry Laurey was appointed in the summer of 2016, taking over from Jacky Dugueperoux. New signings were made to bolster the squad, including experienced Ajaccio defender Kader Mangane, capped by Senegal 23 times, and full back Laurent Dos Santos from Guincamp. The midfield was also strengthened with the hiring of Morocco international Khalid Boutaib and Laval’s Anthony Goncalves, In January 2017, Laurey signed Jean Aholou, an Ivorian, from Orleans. Boutaib (30) scored 20 goals in 2016-17, but he won’t be joining his team-mates in Ligue 1 – he’s quit Strasbourg and is joining Turkish club Yeni Malatyaspor, who have just won promotion to the Turkish Super Lig. Strasbourg only hit the top spot in Ligue 2 with four games to go. They ended the season with a 10-game unbeaten run, clinching the title with a 2-1 win against FC Bourg-Péronnas in front of almost 28,000 people. The good people of Strasbourg clearly warmed to Laurey’s team, generating an average attendance of 17,000. They open the season with a trip to Lyon on the first weekend in August. 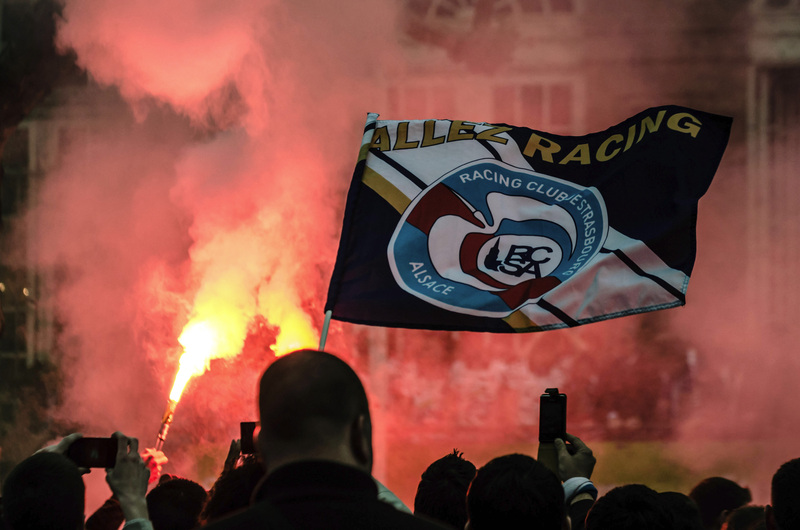 The city has become more well known as the official home of the European parliament than for its football, so the club’s loyal fans will be hoping that Le Racing can redress the balance.